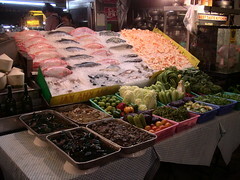 The night market is this multi-block affair that lines the streets and occupies a four story building. It goes from 6:00 pm until midnite. The silk and cotton goods are beautiful, but the variety of food that is for sale is spectacular. Unfortunately, it is hard to photograph due to low light and my poor photography skills.